Many Neopians have come to adore their irresistibly adorable grey pets. Whether it’s because of their large cherry pink eyes, dismayed expressions, or eternal hopelessness, we have fallen in love. Grey pets are celebrated all over Neopia and even have their own special day. But since we are so used to their miserable frowns, I began to wonder, how hard is it for a grey pet to smile? In an attempt to express my love and affection for all grey pets, I have composed these fool proof steps in making your grey pet smile. Step 1: Buy them a petpet. Just as much as you love having a neopet, your neopets love having pets too! Grey neopets are no exception. Buy them a cute snuggly petpet for them to spoil and spend their days with. You will receive extra brownie points if you give them a grey petpet; someone they can cuddle and be grey together with! The duo will be inseparable and absolutely adorable. Step 2: Support their Greyness. All pets want is to be accepted. If you accept and embrace their grey attitude and love their droopy depressed eyes, they will return the love. All you have to do is create them a grey themed lookup, give them A Grey Day Background, or read a few grey books here and there. Ultimately, you have to show them that you care. 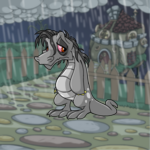 My grey neopet prefers A Krawk’s Grey Day. Once your grey neopet realizes you absolutely adore their grey attitude, it’s impossible for them to resist a smile or two. Step 3: Don't lend your grey pet! 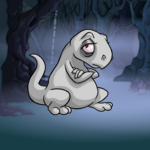 While we all adore their grey themed avatar, grey neopets like being grey for you and you only. Grey neopets tend to have attachment issues. They love you no matter how sad they look so when you send them off to a distant account they feel absolutely devastated! Don’t do that to your grey pet. Show them you can’t be without them as much as they can’t be without you. Step 4: Enjoy a walk in the rain. Take them for a walk in the rain, it’s their favorite weather! Grey pets adore grey clouds; they can’t help but smile at the depressed state of the weather. You don’t want your grey pet to catch a cold, however, so keep them bundled up so you can smell the grey roses together! Step 5: Give them a special sweater. You want your grey neopet to feel comforted and appreciated. Nothing does the job better than a nice snuggly sweater. A sweater comes especially in handy for long walks in the rain as well. Based on your grey pet’s personality you will need to think carefully about the perfect material for their own special sweater. Is your grey pet the neocotton type? Or do they prefer cashmere? Also what is their favorite shade of grey? While picking out their sweater you will notice how picky a grey pet can be, but I assure you, once you find the perfect sweater your grey pet will almost cry with joy. Step 6: Play a game with them. Now this may come at a surprise, but grey pets love playing Ice Cream Machine. Do you know why? Ice cream! It happens to be one of a grey pet’s favorite desserts, despite popular belief. After a few hours of dodging their favorite ice cream flavors, they will be ecstatic and filled with happiness. For extra brownie points, treat them to Grey Ice Cream afterwards! Step 7: Take them on a trip to see the Grey Faerie. The Grey Faerie is a grey pet's idol! Nothing can make a grey pet as happy as seeing the greyest faerie of them all! Though she may be an elusive grey soul, the very sight of her fills any grey pet with the dreariest of joy. Extra brownie points for seeing the Grey Faerie in the rain! However, if you are unable to find the Grey Faerie, there are plenty of alternatives. A Grey Faerie Doll or Grey Faerie Snowglobe can keep a grey pet busy for hours. If you really want to make your grey happy, a new pair of Grey Faerie Wings is the perfect gift. Throw them a grey themed party with all their grey friends complete with grey pizza, grey cupcakes, and grey ice cream. As antisocial as grey neopets are, it’s hard for them to resist a grey party. A grey party isn’t complete without Jazzmosis music, a grey pet’s favorite band. You will get extra brownie points by providing fun grey games! A nice game of pin the rain drop on the cloud should do the trick! Step 9: Make up a secret handshake. This is self explanatory. A secret handshake can make anyone smile. Who doesn’t love a secret handshake? It’s a great way to bond with your pet through clapping, snapping and dancing around! Step 10: Love your grey pet. This is the more effective and probably easiest step of them all. Everyone wants to be loved, grey pets included. Even if your grey pet does not like hugs, a pet on the head, or any form of affection, a simple “I love you” will take them by complete surprise and they will be unable to resist the happiness they feel. Now if this phrase does not take them by surprise, do not fear. There are other ways to show your unconditional love for your grey neopet. You can sneak a Bottle of Love under their pillow at night, treat them to a Love Shake Chocolate, or even better, give them a single Drabby Rose. I hope now, after you have completed my steps, you will have an adorable happy smiling grey neopet. Now don’t be too worried. These steps will not eliminate what you love most about your grey neopet. These steps are for brief smiles and moments of happiness. But your pet will always remain that endearing gloomy neopet that Neopians across Neopia have come to love dearly.